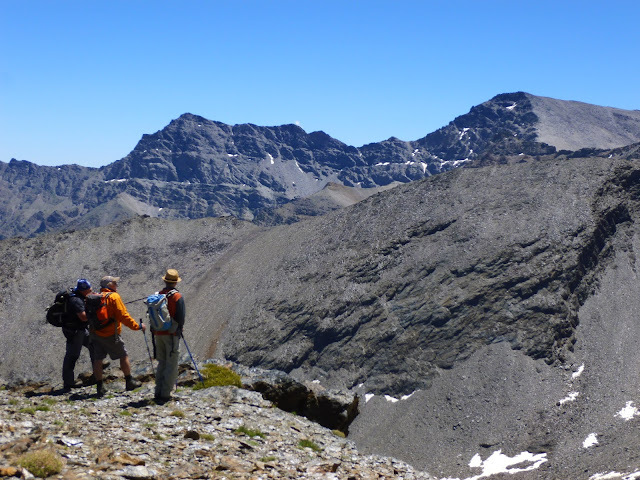 Spain’s Sierra Nevada region is unique in that its altitude spans a massive height difference from about 700m above sea level to the Lofty Mulhacen at 3482m. This give it several distinct climatic zones with a huge degree of biodiversity coupled with over 100 endemic species including 63 endemic species of plant. It is situated about 50 miles east of Malaga on the south coast of Spain and just to the south east of the city of Granada and a day out in the Sierra Nevada mountains makes a great option if you are visiting Granada. Satellite image of The Sierra Nevada showing proximity to the sea. The area in white is snow covered mountains. The Sierra Nevada was first recognised in 1986 when it was awarded the status of being a UNESCO Biosphere Reserve. In 1989 it was awarded “Natural Park” status and in 1998 the central area was awarded National Park status becoming Spain’s 11th National Park. In terms of size, The Sierra Nevada National Park is Spain’s largest with some 330 square miles. It is surrounded by the Sierra Nevada Natural Park of some 340 square miles, so together they are a massive 670 square miles. The land inside the National Park enjoys a higher level of protection. Additionally, people live within the Natural Park (similar to U.K. National Parks), whereas there are no permanent human settlements in the National Park, only summer farms. The Padul Ponds at the western end of the range are significant wetlands and being in the Natural Park also enjoy a higher level of protection. To describe the Sierra Nevada we generally divide it into “climatic zones” which have their own characteristics in terms of wildlife though some species (Iberian Ibex, eagles, vultures, etc.) transcend all zones. The only zone that we describe that is not climatic in the same sense is the limestone area of the western edge of the Sierra Nevada which due to its geology has it’s own unique flora. Terraces of citrus, olives and small holdings. Animals: Iberien Ibex, common Genet. Spring arrives early here, when we can enjoy the terraces of almond, which flowers from February, and citrus where the air can be scented with orange blossom in March and April. Migratory birds are passing through or arriving to nest from March. Wildlife walks at this height are at their best from March through to May. Altitude typically 700m to 1600m. Terraces of Olives, Almonds, Wallnuts, Chestnuts, cherries. Small holdings with Sheep and goats. Typical Alpujarran landscape, early spring. Birds: Hoopoes, Bee Eaters, Booted and Golden Eagles. Animals: Wild Boar, Iberian Ibex. Plants: Various Orchids, Iris, Rosey Garlic. Spring starts with the almond blossom, often in February. However it is still a little early to enjoy much else and the weather is still cool. By the end of March the orchids are starting to flower and all through April and May the flowers are stunning and the migratory birds are arriving back. By June it is getting hot at this level so we now turn our attentions to higher altitudes. Altitude typically 1600m to 2300m. Chestnuts and Wallnuts, summer farms. Birds: Choughs, Ring Ouzel, Eagles and Vultures. Plants: St Bruno’s Lilley, Verbascum nevadense, Pyrenean Oak, Holm Oak. Although it is possible to explore this area in April or May, it is really in June and July that the area is at its best with lovely meadows and flowers, bubbling streams and examples of summer farming (transhumance) still being practised. Cows grazing “wild” during the summer. Sheep and goats led here daily in summer. Spring flowers (mid June) in the mid alpine zone, here an abundance of Broom! To experience the mountainside coloured yellow as the brooms are in flower is a remarkable sight! 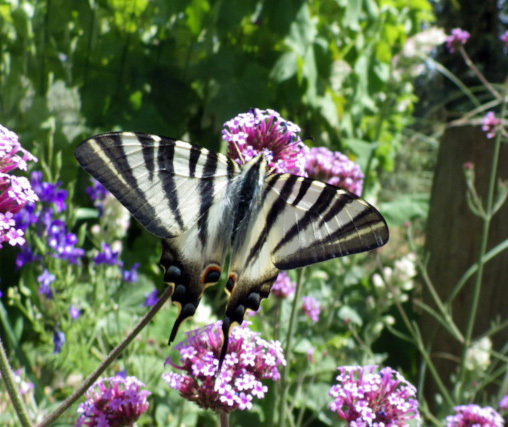 Herbs in flower with the Broom provides a great setting for butterflys, especially the white Parnassius and the Sierra Nevada Blue. In the wetter areas we are treated to a festival of flowers, gentians and the emblematic Star of the Snows. Mid June and through July are the best months. Fortunately the National Park "Interpretation" Service provides busses to 2700m on the south side of the range and to 3000m on the north side making this area relatively accessible. Iberian Ibex, Capra pyrenaica, a common sight. This is a magical zone of many endemic and rare plant species, where swifts and swallows soar and dance in the air, where eagles and vultures ride thermals and “Cabra” – Iberial Ibex frequent close to humans hoping to pick up left over sandwiches! When to come very much depends on how much snow there has been. It’s sually o.k. from mid June and most flowers can be seen through until the end of July. Erigeron frigidus - Cold Fleabane, a rare endemic plant growing at over 3000m, it is thought only 130 specimens remain. Famous especially for plants: Veronica nevadensis, Gentiana sierrae, Estrella de las Nieves, Lotus glareosus, Thin Spurred Butterwort – Pinguicula nevadensis. These are protected wetland areas within the National Park found at heights of between 2600m and 3100m. They may be pools, streams or ribbons of dampness, but they are a distinct habitat with numerous endemic species of plant. Because of altitude differences and aspect, these may be snow free from as early as mid April or mid July. Due to the relative low altitude (!) these areas are often in the range of grazing animals (Sheep, goats and cows), so whereas one day there may be a fine display of flowers (gentians), come back a day later and they are gone! May, June and until mid July are good times to plan a visit to these (depending on altitude and aspect). The limestone extends from lower altitudes (Niguelas 950m, Monachil 700m) to the impressive summit of Trevenque 2080m. The path to Trevenque showing a limestone desert! This area is dominated by the impressive Trevenque 2080m, sometimes described as the Matterhorn of the Sierras. A walk to or around Trevenque rarely disappoints between mid April and June. You will almost certainly see Ibex on Trevenque, but it is the plants that are different here to the rest of the Sierra Nevada. Michael Hunt and Jane Livingstone are both International Mountain Leaders based at their Mountain House at 1300m above Lanjaron. IML’s are trained and assessed in environmental issues and environmental interpretation in addition to mountain guiding. Their walking holidays – “Mountain Walking Holidays” offer Wildlife of the Sierra Nevada Walking Holidays or alternatively if you are in the area, and want a day trip to explore some of the wildlife, this can be arranged through Sierra Nevada Guides. 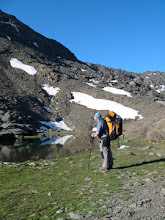 Michael and Jane have been exploring the Sierra Nevada since 2003.